NSG 869 is an Albion Nimbus, with MR9 designation. This vehicle has a Scottish Omnibuses B32F body, and in its early days was a demonstrator for the chassis builder Albion. It passed to that well-known Staffordshire independent, Berresfords Motors Limited of Cheddleton, in whose markings we see it at Duxford on 28 September 2003. The MR9 was the first version of the Nimbus, itself derived from the Claymore goods model, and it was available in two lengths as the MR9N (23ft 3ins by 8ft) and MR9L (24ft by 8ft). The chassis had Albion axles, the rear being driven by overhead worm, and the wheelbase was 11ft 10ins. The four cylinder 3.83 litre EN219 engine was basically two thirds of the Leyland O350, and it developed 60 bhp at 2200rpm. A four speed Albion gearbox was fitted. Certain features of the design were suspect, notably the poorly designed engine by-pass valve method of providing vacuum assistance for the braking system, and the type soon acquired a reputation for frailty, notably in the engine, engine mountings and gearbox departments. A total of 124 of the MR9 type was produced before Leyland in house cost cutting measures led to the appearance of the NS3 model, which had "bought in" standard BMC 5 ton truck range axles that limited the overall width of the vehicle to 7ft 6ins. The NS3 and later NS3AN proved to be just as unreliable as the MR9. Thank you, Roger. I have read somewhere that the amount of exhaust smoke these things produced meant they should have been named ‘Cumulo Nimbus’. …and this from the maker who used ‘Sure as the Sunrise’ as their slogan! It’s strange how the heavyweight British bus manufacturers struggled to produce a successful small bus in the post-war era. The lightweight manufacturers seemed able to produce successful designs albeit mainly used for coach duties but the big boys never seemed to be able to scale down the likes of the Reliance and Tiger Cub to produce what we would now call a ‘midi-bus’ with any degrees of success. Probably Bristol were the most successful with the SU and then the LH. However I always find it difficult to judge the success or otherwise of Bristol products based on volume of sales as throughout the 1950’s and most of the 1960’s they had a captive market with the BTC/THC companies. Of course pre-war Leyland (Cub) Albion (Victor) and various marques from Dennis Guy and Thornycroft all competed against the Bedford and came off worst, even Ford stopped competing for a while (c1932-57). Just pre-war there were Kew Dodge and Opel Blitz competitors, but they were selling on keen prices and immediate delivery, like Commer and Austin post-war. The Nimbus itself was inspired by Scottish Omnibuses building a Claymore-based 32 seat integral bus. Most of SBGs single decks were then 35-seat half cabs and all were crew operated. This was at the same time Bristol and ECW were making the SC. As for the SU it was only introduced after Western and Southern National refused SC’s wanting something comparable to Devon General’s Nimbii. Why was the SU better than the Nimbus? I think it might have had better engine mounting and it certainly benefitted from Bristol chassis well integrated with its ECW body. Secondly nobody in the THC command economy would dare put an SU on a full-size route without good reason. Finally they were confined to Western & Southern National with only a handful elsewhere and so never got a hard life. What we now call a midi-bus (e.g. the ADL E200) is rather bigger than a pre-1962 Reliance or a Tiger Cub, although its seated passenger capacity may be less than an OB. The SC sat 35 in what were pre-1950 maximum box dimensions of 27’6" by 7’6" and it was miraculously fuel efficient at the expense of levels of noise vibration and harshness that would be unacceptable today providing marginal power that would be a hazard in modern dense traffic. but again Crosville Lincolnshire and Eastern Counties mainly used them to move fresh air along empty roads. One of Maidstone and Districts batch of Albion Nimbus/Harrington single deckers resting at the rear of the now demolished Tonbridge Depot. Its normal duties would have been the local town service route 77 which ran a twenty minute headway. The route always had Albions which I think may have been due to narrow roads at the town end of the route. 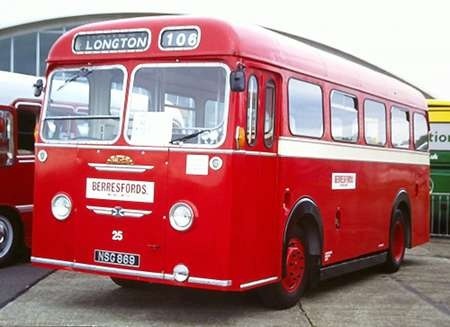 Tunbridge Wells also had an allocation of Albions for town service, these periodically ventured out into the countryside on route 110 to Mayfield which featured climbing the one in ten hill into Mayfield high street, and the route 107 out to the village of Chiddingstone which again featured hilly terrain. What many operators would have taken as a utilitarian vehicle has been turned from a Plain Jane into a Glamour Bus by the wheel trims, the shaped destination box and M&D’s treatment of the front under the windscreen. A shining example of how to improve the visual environment. I have often thought that, the frontal treatment excepted, these Harrington bodies very closely resembled the Weymann bodies fitted to the Western Welsh and Halifax machines. Did they share the same framing design, perhaps? Western Welsh 1-24 had Harrington bodies, the M&D batch followed on from them. Western Welsh obviously had Weymann build 25-48 to the same outline; they also used a version of the outline for Halifax’s infamous batch. I joined the M&D in 1961 fresh out of college. Having passed my PSV test on I think DH156 (It had a sliding window behind the driver) I set out to discover Kent and Sussex. 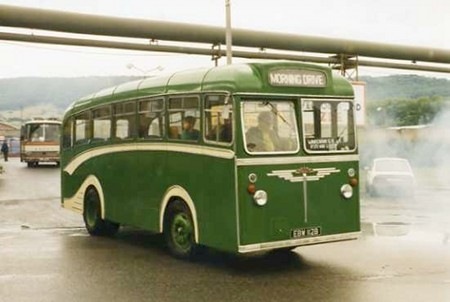 This was the time when we had full buses and a variety of vehicles, Leyland, AEC, Guy, Daimler, Bristol, Commer and old SARO, RKE R4O which must have been the slowest most awkward vehicle to drive!!! Most times I was out in rural Kent with the occasional sortie onto the main key where shift times allowed. It was also profitable the most hours that I got paid for in one week was 108 comprising normal shift pay plus some double and treble hours, marvellous. I still at the advanced age of 79 remember those days with nostalgia and have my original badges, drivers KK37733 and conductor KK41873. Here is a view of an Albion Nimbus, registration 14626. She is in the green and cream livery of the Guernsey Railways fleet and has a Reading body, with fleet number 72. 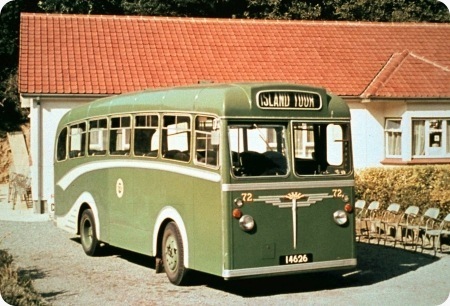 The Guernsey Motors vehicles were a dark red (quite near the Northern General or Ribble "cherry") while Guernsey Railways vehicles were in this green and cream. She’s at Le Gouffre during a refreshment stop on a morning drive. At least, my ticket was for a morning drive, but the blind is set at Island Tour. Given the size of the island, I’ve never discovered the difference! Did the afternoon drive have a different route? The date is 15 September 1972. Here is its twin number 173 (14651) at the centenary rally in Usti-nad-Labem on 19/06/1999. It had travelled from Wareham to the Czech Republic under its own power. It was even blinded for the "Morning Drive". What a superb event it was, we attended on ex North Western Road Car 413 (JMA 413L) a Bristol RE/ECW. Am I being unrealistically demanding in thinking I’d have expected something a little more fancy than a stage carriage Albion Numbus for a scenic trip? No Roy. I would have baulked at the regular use, by Ribble, NWRRC (and friends) of service buses on their X2/X60 type services. I had a very enjoyable ride around the Isle of Wight last month on a B10M coach – and also later on open-topped Olympians! SUT, Yorkshire Services and the local indies always gave us coaches in Sheffield. So, MORNING DRIVE did exist on the blind, then? I suppose setting it for ISLAND TOUR covered most eventualities!!! I see that Dave’s note was posted 40 years to the day since I captured the scene. Yes, Roy, most folk would expect something a little more grand for a tour, but I don’t recall seeing anything like that. This, after all, is somewhat more upmarket than the Albion CX or Bedford types elsewhere in the Guernsey fleets at that time. In response to Roy and David’s comments: Guernsey is quite small and distances short; and traffic very thin – I assume that economics dictated, and geography allowed, the use of buses on tour duties. Could Guernsey Railways/Motors have justified the purchase of special narrow-bodied coaches – and wasn’t the Guernsey width limit 7’4"? – which would have "laid up" out of season?. Its quite a different proposition to the use of buses for coaches on the mainland. Anyway, perhaps this was the Nimbus’s finest moment: tootling around impossibly narrow lanes, providing a "big bus" service where only truck-derived Bedfords followed . . . (until the Trafalger years). Not sure why people are referring to Albion ‘CX’ vehicles when they never operated on Guernsey. If they are referring to Victors (FT and earlier PH models), from 1950 the bodywork they carried (which was developed by Heaver and Guernsey Railways), was effective classed as ‘Service Coach’ standard, to be used on both stage carriage and island tours, etc. We would today classify this as Dual Purpose. 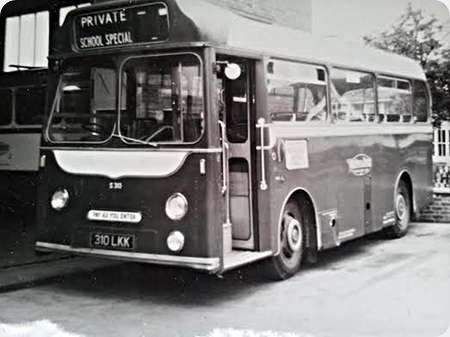 The Abion Victors (the chassis of which was also sold as the FT3 truck range) were followed by the Nimbus model, the style of body being adapted by Readings of Portsmouth), which was an underfloor engined Albion Claymore lorry chassis marketed under a different name for PSV use. Guernsey’s final ‘standard’ vehicle to use this style of curved waistrail ‘Service Coach’ bodywork was the J4EZ1 model, which was derived from the Bedford truck range but popular for PSV and coach use between the OB going out of production and the VAS being developed. Guernsey’s buses were no less inferior for their use of HGV derived chassis, nor were the many hundreds of Bedford J2 coaches used throughout the UK in the 60’s and 70’s. Of course the VAS chassis, designed for bus and coach use also ended up carrying truck bodies such as mobile library’s, etc. From an engineering point of view rural bus chassis and truck chassis were all but identical from the turn of the 20th century right up to the end of the 60’s, essentially being the same 3, 4 or 5 ton models, marketed under different names. Contrary to misconception, all of Guernsey’s Albion Victors, Nimbus and Bedford J4 vehicles (delivered between 1950 and 1972), carried Service Coach bodywork for dual-purpose (stage carriage and tours) operation. Their seating was identical throughout the classes being of the double-arched semi-high backed variety, well upholstered, though the moquette was updated over the years. As far as the chassis were concerned, as John has pointed out above, the Albion Victor was derived from the FT3 truck series, the Nimbus was evolved from the Claymore underfloor-engined lorry and the J4EZ1 was Bedford’s long wheelbase 5-ton bonneted truck converted to forward control at the coach-builders under supervision from the local Bedford Agents. In essence vehicle manufacturers frequently used engines, gearboxes, axles, cross members, braking and control systems, etc in common across their PSV and HGV ranges, only the chassis side frames for the former were specifically designed to ease the fitting of passenger bodywork, often being cranked over the axles to reduce step-heights. However, in terms of ride quality, comfort or reliability there was absolutely no appreciable difference between PSV or HGV chassis. The width restrictions in Guernsey necessitated some diverse thinking with regards to chassis supply, often it was the axles that were over-width so it was more convenient, expedient and commercially acceptable to receive off-the-peg width-conforming 5-ton chassis rather than have a full blown PSV types converted to suit, which would have been a costly and often time-consuming exercise, where large volume manufacturers would need to take standard chassis off-line and effect bespoke modifications. In pre-war days the maximum lawful vehicle width was restricted to 6′-6", this was changed to 7′-0" in 1945, then relaxed to 7′-4" after the last J4EZ5 / Pennine vehicles arrived in 1974. Due to restricted model availability, this was further relaxed to 7′-6" (for certain routes only)in 1979. The 7′-4" vehicles that remained in the fleet after 1979 had their fleet numbers amended with an ‘A’ indicating they could serve ‘A’nywhere on the island’s route network. The 7′-0" wide vehicles also received the ‘A’ suffix at the same time. I have the privilege of owning Guernsey Railways 77 and have in the past owned several FT39 Albion Victors. As has been previously mentioned the vehicle chassis is in principal Albion Chieftain FT37. On one occasion I purchased a life expired Chieftain for spares, the only difference I came across (to my cost) was that the truck road springs are shorter than the PSV springs, I assume to give the passengers a softer ride. 77 has now been in preservation for 35 years her operational life was just 23 years! whilst in preservation 77 has been "On the road" for at least 30 of the 35 years. A good testament to Readings the body builder, Albion and her post Guernsey Railways owners. Well said, Peter, in your comments about Readings, Albion and 77’s owners in preservation. It makes one wonder how many Enviro 400s will still be around in 35 years time. Incidentally, where I used to work, there were five of us named Peter Davies or Davis. We identified ourselves by using the Welsh system of ‘Davies the . . .’ The silly thing was that the one with the English spelling (no E for the uninitiated) was Welsh [Davis the Welfare, as he was in Social Services] and the four with the Welsh spelling were English, at least by birth although my grandfather WAS a Welshman! We were continually receiving each others post, and used to meet several times a week to exchange papers. No such troubles in your workplace, I hope! Guernsey Nimbus 75 16216, now carrying a UK reg JNP 590C, is also preserved and was out yesterday on the Cheshire Run, part of Drive it Day 2016. And 175 will be out on the Cheshire Run again today.